Academics are not happy with what the Canary Mission has unearthed in the past 14 months. 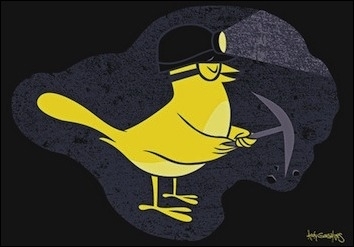 I was alerted in May 2015 to the opening of an anonymous new project named Canary Mission and tweeted out information on it: ". @CanaryMission is a new org'n that builds bios of US campus anti-#Israel fanatics so future employers will know their full college records." Factually documenting who one's adversaries are and making this information available is a perfectly legitimate undertaking. Collecting information on students has particular value because it signals them that attacking Israel is serious business, not some inconsequential game, and that their actions can damage both Israel and their future careers. Then came the attack articles; by way of illustration, the appalling Max Blumenthal wrote three pieces on Canary Mission in a two-week period at alternet.org. In one, he called me "a de facto spokesman" for Canary Mission because I passed some questions from his co-author, Julia Carmel, to the anonymous staff at Canary Mission. Now comes a petition titled "Graduate Admissions Faculty Condemn Canary Mission Blacklist" signed by dozens and dozens of academics which "unequivocally assert[s] that the Canary Mission website should not be trusted as a resource to evaluate students' qualifications for admission." Okay, got it. They are saying Canary Mission does not maintain high academic standards, as the worthies who signed this petition of course do. But then, what about this sentence? Though the creators of Canary Mission remain anonymous, it has been linked to, and utilized by, such well-known individuals as Daniel Pipes  and David Horowitz , who have been labeled as purveyors of hate speech by the Southern Poverty Law Center  . Three other activists, Steve Emerson, Daniel Pipes and Frank Gaffney, have interacted with many of the core group [of 10 hardliners] as well and also have offended many Muslims, but they are somewhat more moderate in their views of Muslims than those who are profiled below. In brief, I am neither linked to nor have I utilized Canary Mission. SPLC did not call me a purveyor of hate speech. Ironic, no, that the academics who declare Canary Mission "should not be trusted" themselves cannot be trusted. Once upon a time, now quite a while ago, academics did actual research. Now too many of them are content to posture and fabricate. Oh, and by the way, from what I can tell, Canary Mission is entirely accurate and can be trusted.